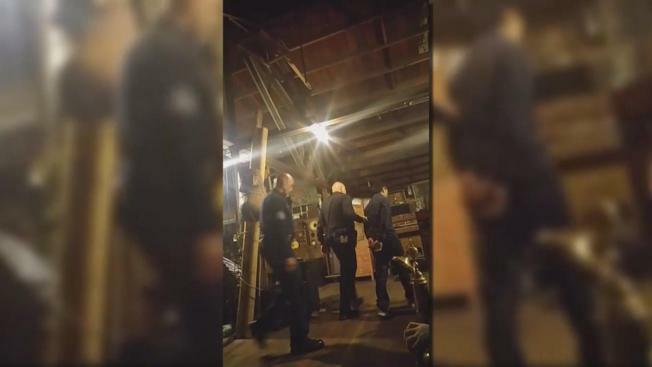 Oakland police officers were caught on camera arresting someone at the so-called “Ghost Ship” warehouse, about two months before an inferno killed at least 36 people and ravaged the structure. The video, obtained by NBC News, shows officers inside the Fruitvale neighborhood warehouse in October. They are seen arresting a person in connection with a complaint stemming from a party that was held there. Derick Almena, the live-in manager of the warehouse, said he gave police access to the roof of the building during that visit. On Tuesday, Almena refused to answer questions about safety protocol at the warehouse before the fire. The building was permitted for use only as a warehouse, but at least 20 people were living there as part of an artists' collective called Satya Yuga, public records show. Many in the community are asking if the video is proof of a missed opportunity for someone to raise concerns about the building that has been described as a “deathtrap.” Meanwhile, police have refused to comment on any visits to the warehouse, citing the ongoing investigation into the fire.